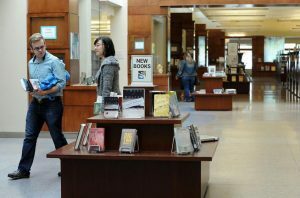 Fort Collins, CO, April 18, 2017– Loveland Public Library has built a reputation for innovative programming and technology. Digital Workshop Center (DWC) has been a community center for education and professional development for the past ten years. Both parties are now collaborating to bring advanced technology classes to the Loveland Library classroom, at no cost to the public, this May. In the past, Loveland Public Library has offered basic computer skills classes including Microsoft Office, introduction to computers, and introduction to Google Apps. With this new partnership with DWC, Loveland Public Library will lean on DWC’s vast network of certified instructors and expertise to add new classes on web design, social media, digital marketing, handheld devices, and more. “It’s an exciting opportunity to offer more variety of classes for our patrons. The Digital Workshop Center has a robust offering of classes that we plan on tapping into more as time goes on.” According to Jesse Lopez, the Loveland Public Library Technology Manager. Other plans for these partnered classes include live-streaming “micro-learning” topics. Micro-learning ideas are shorter, specific topics that can help answer student’s questions more directly than a general class. Schedules and registration are available on both lovelandpubliclibrary.org and DWC’s websites. Established in 2006, Digital Workshop Center (DWC) is a community center for education, co-working, and professional development. DWC’s mission is to always bring the human element to the classroom – DWC training is always live and hands-on; no self-paced videos. Locally owned and headquartered in Colorado, DWC serves a vital role in workplace education as a career skills training school and Adobe Authorized Training Center.